Avondale Stadium hosting a pair of Trail to the Title Middle School Football Playoffs games on Saturday. Eight teams are headed to the 2018 Trail to the Title Playoffs this weekend and two of the teams, Stephenson and Lithonia, are undefeated with region titles in their grasps. Lithonia wrapped up its second consecutive Region 3 title and first-ever undefeated regular season with a 12-0 victory over the Miller Grove Wolverines (2-4) on Saturday at Avondale Stadium. The Bulldogs (6-0) got a pair of touchdown runs by Jacoi McClary to account for all the scoring in the game as the defense recorded its third shutout of the season. Miller Grove’s Daevon Hinton had eight tackles in the defensive battle for Miller Grove. Lithonia (6-0) hosts Henderson (5-1) at Avondale Stadium in the first round of the Trail to the Title Playoffs. Game time is set for 10:00 am. An 18-2 victory over the Champion Chargers Saturday at Hallford Stadium on Saturday gave the Stephenson Jaguars their fourth undefeated regular season in the past five seasons. Stephenson (6-0) also claimed its sixth consecutive region title as its defense did not allow a score all season. Marvin Brooks was a big reason for the victory as he had two sacks and Tymere Burton recovered a fumble in the end zone for one of the Jaguars touchdowns. DeAndre Lampkin (5 yards) and Jayvonne Dillard (2 yards) had rushing touchdowns for Stephenson in the win. Andrew Perry had an interception as the Chargers’ (3-3) defense allowed just two scores in the game and picked up a safety for Champion’s only points of the game. Stephenson (6-0), the No. 2 ranked team in the B2C Prime 21 Poll, has a rematch with the Cedar Grove Saints (4-2), honorable mention in the B2C Prime 21, in the first round of the Trail to the Title Playoffs on Saturday at North DeKalb Stadium at 10:00 am. Stephenson blanked Cedar Grove 8-0 in the season opener for both teams. The B2C Prime 21 No. 6 ranked Tucker Tigers (5-1) picked up a 6-0 overtime win over the No. 19 ranked Henderson Cougars (5-1) at Adams Stadium on Saturday to claim their sixth consecutive region (1) title heading into the playoffs. Both teams battled to a 0-0 tie at the end of regulation. Henderson got the ball first in the overtime and failed to score as the Tigers held on fourth down at the 10. Tucker’s Jayqunn Billingsley fought the final three yards for the game-winning touchdown to give Tucker the Region 1 championship. Billingsley was named the B2C Player of the Week for his play on both sides of the football in the win. Tucker has a date with the Region 3 runners-up Redan Raiders (4-2) in the first round of the Trail to the Title Playoffs. 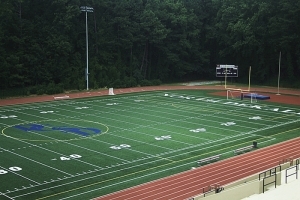 The teams meet for an 11:30 am kickoff at North DeKalb Stadium on Saturday. 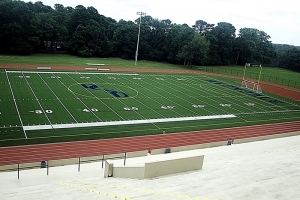 North DeKalb Stadium hosting two first round Trail to the Title Middle School Football Playoffs games on Saturday at 10 and 11:30 am. A seventh region title came home to Bethune on Saturday at Avondale Stadium with a 40-0 win over Columbia (1-5). It was the second consecutive Region 4 title for the Lions (5-1) who won the head-to-head with runner-up Cedar Grove. Isaiah Logan and Bernard Mack both threw for two touchdowns in the win. Josh Peterson (25 yards), Letrelle Richardson (20 yards), Deshon Tutt (30 yards) had one touchdown reception each in the game. Ventrillo Dunlap (10 yards) and Jaiden Fiagro (30 yards) added one touchdown rushing apiece in the victory. Fiagro led the way on defense with 10 tackles. Redan’s Xavian Green threw for two touchdowns and ran for another to lead the Raiders (4-2) into the Trail to the Title Playoffs for the first time since 2014 with a 28-0 win over Freedom (2-4). Green finished with 89 yards passing hitting on both his pass attempts and had six carries for 107 yards. Dexter Howard was on the receiving end of both touchdown passes and Trent Fields added a one-yard touchdown run. Jayden Warren led the Raiders’ defense with 11 tackles followed by Adrian Walker with 9, Jordan Walker 8 and Antonio Molder with 6 tackles and an interception. Dharrain Smith picked up two sacks and forced a fumble to add to the defensive effort. Defense was a big theme last Saturday and it was no different as the Cedar Grove Saints (4-2) shutout the Chapel Hill Panthers (3-3) for three quarters to hold to an 8-6 playoff berth victory at Godfrey Stadium last Saturday. After allowing the Panthers a first quarter touchdown that put the Saints down 6-0, the Cedar Grove defense stepped up to keep Chapel Hill out of the end zone over the final three quarters of play. Linebacker Artre Jones and defensive ends A.J. Green and Capone Jackson came up big for the Saints’ defense. Neashawn Parsons tied the game in the second quarter on a 48-yard touchdown run. He then put the Saints ahead by converting the two-point conversion via his legs again. It was all defense on both side the rest of the way. It is the Saints ninth consecutive playoff appearance and 13th overall in the 15 years of the Trail to the Title Playoffs. The Renfroe Bulldogs earned their fourth trip to the Trail to the Title Playoffs with a 42-14 win over the Druid Hills Dragons (1-5) at Decatur last Saturday. It is the second consecutive playoff trip and fourth in the past five seasons, missed the 2016 season. Druid Hills got touchdowns from quarterback Antrezt McDowell and Wesley Hayes Jr. in the game. Jonathan Turner had an interception for the Dragons.